5 Bedroom Detached House For Sale in Harpenden for Asking Price £2,150,000. A substantial and extremely attractive brand new home of approximately 4,500 sq ft arranged over four floors, built to a very high specification by developers of repute, Bloomsbury Homes. 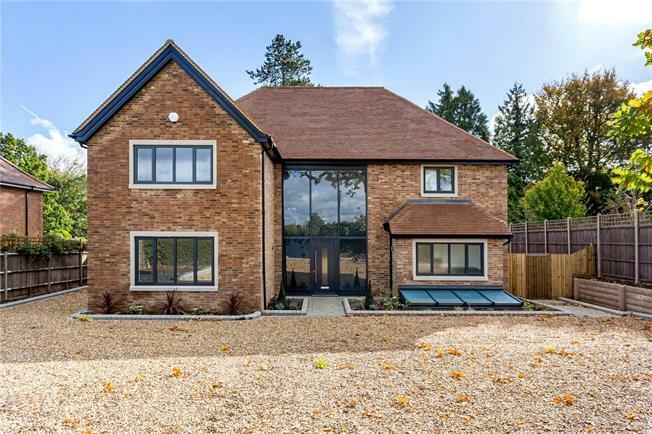 On the ground floor there is an impressive double volume entrance hall with galleried landing above, featuring a stunning double height window to front with integrated remote controlled blinds. The kitchen, which is open to a spacious and versatile family room/dining space with bi-fold doors onto the garden, is fitted with beautifully handcrafted bespoke units with quartz worktops and features a range of high specification integrated appliances. Off the kitchen is utility room with door to the side. Additionally on the ground floor is a spacious living room and a beautifully fitted guest cloakroom. The basement is sumptuously appointed and benefits greatly from natural light, courtesy of a large light well which forms a small courtyard with a spiral staircase up to garden level, there is a further large light well at the front. The basement comprises; home office, gym/games room, home cinema room, kitchen, shower room and the plant room. On the first floor there is a stunning main bedroom suite with fitted dressing room and luxury en-suite bathroom, two further double bedrooms, each with en-suite facilities and a laundry room. On the second floor there are two futher generous bedrooms and a large shower room. Twin Oaks is located in the much favoured West Common area of Harpenden on a south facing plot and with views over agricultural land to front from the upper floors. The property is only 1.3 miles from the station (St Pancras 26 mins) and High Street. Approached via stylish gates the spacious driveway affords off street parking for numerous cars and there are two impressive Oak trees after which the house is named. To the rear is a delightful professionaly landscaped south facing garden, which is principally laid to lawn with extensive paved terrace and secure fencing and specimen trees to the boundaries.